Pressure washing in Southampton by our team of professional jet washers using high powered equipment and the latest training. At iShine Cleaning Solutions, we have invested in some of the most powerful jet washing equipment available today. By using these systems in conjunction with specialist training, we can provide a high quality, low cost pressure washing service to both homes and businesses. 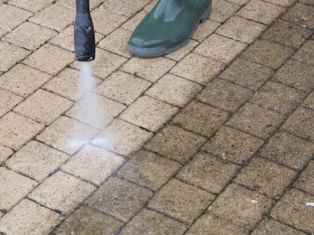 Our pressure washing techniques and systems are ideal for any type of hard surface, including painted surfaces and can remove dirt, mould, bird droppings, chewing gum and more. Pressure washing is an incredibly dangerous task but our jet washers have the skills, training and experience to carry this out quickly, correctly and safely. Call iShine Cleaning Solutions in Southampton for your pressure washing requirements.